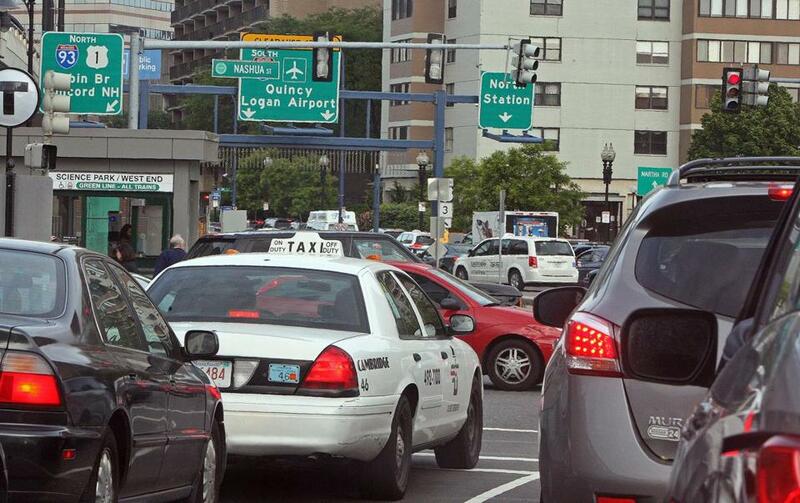 A traffic jam in Boston near the Leverett Circle area (pictured) in this June 7, 2012, file photo. The next time you find yourself gridlocked in downtown Boston, watching a distant traffic light cycle from red to green and back to red, you can cheer yourself with this thought: There are 18 cities in North America where the traffic is worse than it is here. According to TomTom, a manufacturer of GPS navigation devices, Boston is the 19th most congested city in North America, behind such cities as Vancouver and Miami. The company’s Congestion Index report for the first quarter of the year, which surveyed 26 North American cities, found the absolute worst traffic is in Los Angeles. On average, Boston commutes take 16 percent longer than they would if traffic were flowing freely — like in the middle of the night. In the evening rush, however, Boston commutes take 35 percent more time than they do when everything is moving well, according to the TomTom report. By comparison, Los Angeles commutes take an average of 33 percent longer than they would in free-flowing traffic and a whopping 77 percent longer during evening rush hour. Boston commuters face an average delay of 19 minutes per driving hour. Local drivers with 30-minute commutes were delayed 55 hours a year, according to the report. Tuesday mornings and Friday evenings were the most congested times to travel; the best times to travel were Friday mornings and Monday evenings. Boston had more congestion on nonhighways than it did on highways, according to TomTom. If it’s any consolation, congestion is improving in Boston. For the first three months of 2011, the city was ranked 14th worst in North America; this year, it was newly surpassed by Dallas-Fort Worth, Chicago, San Diego, and Houston. Nick Cohn, head of congestion research at TomTom, attributed the drop to the mild winter. “There were several blizzards in early 2011 and it was significantly colder last year, both of which are factors that can impact traffic significantly,” he said. TomTom, which is based in Amsterdam but has its North American headquarters in Concord, compiled the report from real-time travel data captured by its devices in vehicles driving along the entire road network within the selected cities. Since 2004, TomTom has sold 60 million navigation devices around the world. 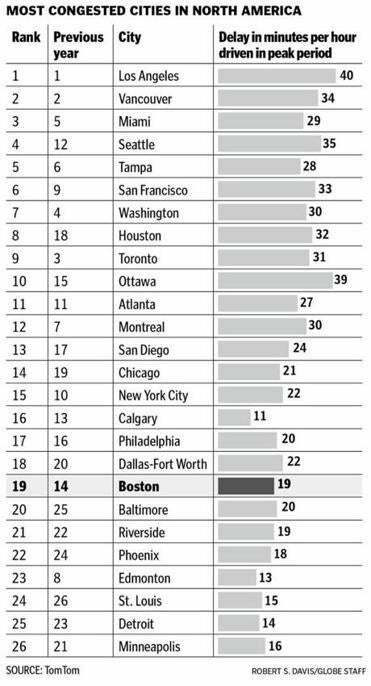 INRIX, Inc., a Kirkland, Wash., company that monitors traffic congestion, lists Boston as the 11th most congested in the United States in the past year. That result is not far from the conclusions of the TomTom report, which lists five Canadian cities as having heavier traffic congestion than Boston does. Thomas J. Tinlin, commissioner of the Boston Transportation Department, was encouraged by the city’s slide from 14 to 19 in TomTom’s survey. Earlier this year, six engineers from IBM Corp. spent three weeks in Boston’s City Hall as part of a company program to help cities better manage their data challenges. The team helped the city build a prototype software application that collects data from city computers, street video cameras, road sensors, and databases to create a real-time picture of Boston’s traffic.